Found out a new game today morning and it seemed interesting. Most of you might have already heard about the game 2048. It was a simple math or puzzle type game where you need to build a 2048 square combining small squares like 2 and 4. Rather than explain you the game, it would be easy to ask you to play and learn (Just Google for 2048 game). Winning is easy but i tried to find a sure way to win in all games. It is very simple. 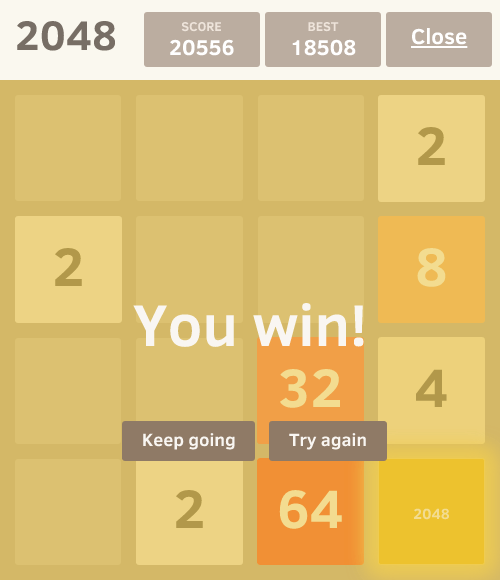 Using the following method you can win any 2048 game. Do not slide it to all directions. This is the most important thing you have to keep in mind. Always make sure that you bring the high value cells to one corner. Make sure that all squares are arranged in a descending order from that corner. Do not think about anything else, combining the squares will come naturally when you try to keep above property. Longer you keep it, you will reach higher scores.